The Everywheres — Nicholas Hanlon, left, Samuel Hill and Adam Gravelle — perform an outdoor show in Halifax. The lead singer and guitarist for the Halifax band, The Everywheres, is recreating a sound and style from the 1960s – a sound he describes as psychedelic pop combined with garage rock. Hill, 24, was born in Halifax, grew up in the city and first picked up a guitar at 13. Formerly of the band the Spooky Campers, he’s the creator of all The Everywheres’ material. Hill combines reverb-filled vocals with swirling guitar riffs, bouncy bass lines and catchy percussion. He writes the core of the band’s songs, while the three other members work with what he produces. 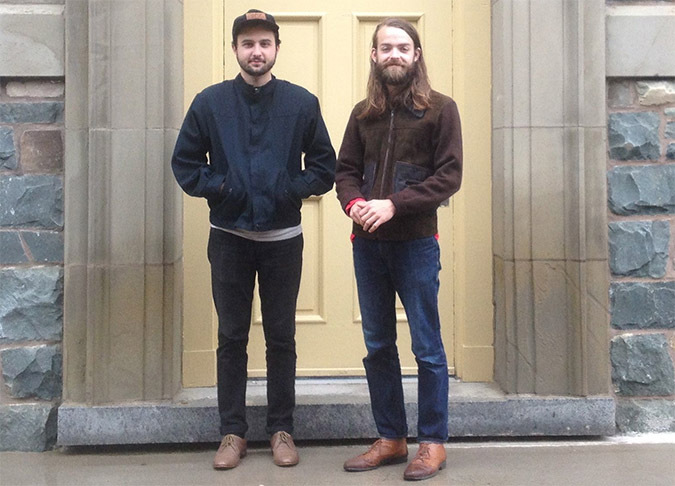 The Everywheres formed in 2013 and have been steadily gaining a fan base in Halifax. In May, it released an eight-track album, Habitualism. The band has played most of the popular venues in Halifax, including Gus’s Pub and Reflections, and performed during NSCAD University’s orientation week. In late May, the band embarked on two-week road trip, with friends from the band Walrus, through New Brunswick, Quebec and Ontario. It was Hill’s first experience on tour. Aside from playing gigs, the band’s managed to spread its sound all the way to California. It has released several songs through San Francisco’s Father/Daughter Records. Two songs are also featured in a video for Surfer Magazine, based in San Clemente. Hill says the band is lined up to release a two-track record with a Spanish record label in the next few months. The band’s rhythm guitarist, Nicholas Hanlon, studies graphic design at NSCAD University. He says he’s hoping to finish his degree this semester, then dedicate more time to music. In the New Year, the band hopes to embark on its first tour in the United States. With a fresh sound, groovy style and high skill level, the future could be bright for The Everywheres. Can music become more than just a hobby? Nov. 5 – The Axe Lounge, Acadia University, Wolfville, N.S. Nov. 24 – The Wardroom, King’s College, Halifax, N.S.